We love intrigues and mysteries, don't we? Conspiracies are big news. The media industry loves them because we love them, but how much truth do they represent? Don't you want to know what really is going on, who really is pulling the strings in our World today? Wouldn't it be a refreshing change to be presented with the real truth? Is history just a random sequence of events, or are there secret manipulations? What makes us tick? How did the World as we see it come to be? In this short book we will be delving below the surface of our existence on this planet, glimpsing at the possibilities beyond the daily routines of just getting on with life. The conspiracy we uncover has tentacles in all spheres of human life, so where it leads we will follow. We will be taken into areas of science, history, human behaviour, popular culture, religion and little green men. Read this book if you are prepared to be challenged. 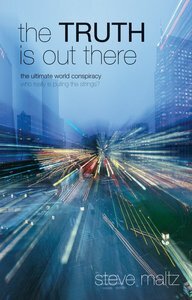 About "The Truth is Out There"
Steve works mainly as a web media consultant, specialising in internet television and helping to promote web sites with search engines. He is also a tour guide in East London. In his spare time he writes stuff. In the early 80s he scraped a living writing computer games for such dinosaurs as the BBC Micro, Dragon 32 and Sinclair Spectrum, before graduating to the PC (when it had just a single floppy disc drive, no hard disc and a whopping 512K of RAM). He was responsible for the design (and most of the programming) of the Christian computer products, Conflict in Jerusalem, Risen and the CDROM of the Bible of Christianity (all marketed by Lion Publishing), Discover the Truth (Sunrise Software) and The Olive (Saltshakers). He also designed eMESSIANICA (Saltshakers) and the NIV Thematic Study Bible (Hodder & Stoughton). He is the author of The Land of Many Names, Jesus: Man of many names, The Truth is Out There and 77 Talks for Bored-Again Teenagers. He is married with three sons and lives in East London.